Cloud Computing is a variety of services and infrastructure provided by technology companies to consumers and businesses over the web. The term first gained popularity towards the end of the last decade and covers a range of solutions from personal storage to business infrastructure, and even access to remote software packages. The cloud is increasingly changing the way we use computers and personal devices. In its simplest form, cloud hosting provides users with a virtual hard drive which can be used to store documents, media and other file types in the cloud. The popularity of this type of cloud based storage has risen in recent years alongside massive growth in smartphone and tablet usage. There are two key benefits to using cloud storage over storing files locally on a device. Firstly, cloud storage allows for much higher storage capacities than would be possible on smartphones and tablets, and increasingly even most PCs. 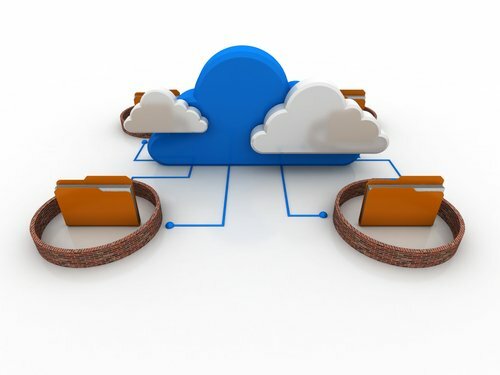 Additionally, cloud hosting allows synchronisation and access to files across multiple devices, for example, a photograph taken on a smartphone can be uploaded to the cloud and immediately available on the user’s tablet or PC, or accessed via another computer over the web. Critics of the model point to the potential security risks in entrusting sensitive data to third party companies, however most offer secure connections and encrypted transfer, alongside robust backup systems which would be complex and expensive for the majority of consumers to replicate on a device level. There are a variety of companies offering consumer level cloud storage, most of whom operate a freemium model where a basic level of storage is free, with a monthly subscription charged to increase storage capacity. One of the first household names in cloud storage was probably Dropbox, which launched in 2007 and allowed users to synchronise files across devices via virtual folders. Since then a range of similar services have been launched by the major technology companies. iCloud is the most well known among Apple users, with an initial 5GB of space offered for free, and the option to purchase more storage in increments. Android users will be familiar with Google Drive, a similar service which also offers extra free space to consumers purchasing Google branded hardware, for example at the time of writing the Chromebook laptop comes with an additional 100GB of free cloud storage. From Microsoft there is OneDrive, with 15GB of free cloud storage, and extra allowances offered periodically to users migrating from competing services. At a business level, cloud hosting goes beyond simple storage to provide sophisticated environments in which web sites and web applications can be run. Where traditionally companies would be required to purchase or hire one or more dedicated web servers for this purpose, it’s increasingly common for them to make use of cloud infrastructure. One of the biggest names in this space is Amazon, whose Amazon Web Services provides a range of storage, computing, networking and database services, all hosted in the cloud. A key benefit to businesses of this type of solution is its flexibility, or “elasticity”, meaning the level of service can expand or contract to meet changing demand. For example, Business X has a web application attracting 400 users per day on average, but occasionally sees peaks up to 10,000 users. With traditional infrastructure, they would have to purchase or hire sufficient resources to cater to the peak number of users, which most of the time would be redundant. With AWS and similar services, the capability of the system would expand to cater for the peaks, and contract in between times, with the company being billed accordingly. Other big names in the cloud infrastructure space include Microsoft, with its Azure platform and Google’s Cloud Platform, each offering comparable features and pricing to the Amazon service. Traditional web hosting providers have been quick to get in on the act too, such as Rackspace with their Public Cloud, and newer services such as Clouder and Digital Ocean are increasingly competing on the basis of simplicity and speed of deployment. Another facet of cloud computing which has become extremely popular in recent years is the rapid rise of media streaming services. As Internet connection speeds, even via portable devices, have increased it has become feasible to stream movies and music directly from the cloud to the users device without the need to download, or indeed formally “own” the files. Instead, these services operate on a subscription basis, allowing unlimited access to media libraries for a monthly fee. The first widely known service to utilise this model was probably Spotify, launching in 2008 with a free ad-supported account or the option to remove advertising for a small monthly payment. For TV and movies, Netflix is probably the best known service, originally an Internet based DVD rental service, in 2007 they launched a streaming service in the US, with a similar service soon offered by Hulu. The major tech companies have been quick to follow suit, with both Google and Amazon offering music and video streaming via their Google Play and Amazon Prime services respectively, as well as Apple, which came somewhat later to the party with Apple Music launching earlier in 2015. A key area of growth in cloud computing is the Software as a Service model, or SaaS. Increasingly, companies are offering access via the cloud to software packages which would previously have been installed on a user’s local PC. This requires less computing power on the part of the user, and makes updating and improving the software simpler from the manufacturers point of view, as well as ensuring compatibility across devices by using common web standards. A good example is Microsoft’s Office 365, a subscription based service which allows access to the Microsoft Office suite via a web browser, or smartphone or tablet app. Google Docs offers a similar set of features, and like Microsoft, takes advantage of the cloud technology to allow advanced collaboration and sharing options on documents. As the technology improves, we can expect to see more SaaS applications made widely available, from music and video editing software to graphic design programmes and even high level gaming. The huge variety of cloud based services available and currently in development marks an increasing shift in the way we use technology in 2018. The key change is the use of improved Internet connectivity to allow service providers to take responsibility for the hardware and software, with the end user’s device acting merely as a client. Interestingly, this shift is arguably a return to the early days of computing, in which large mainframe computers running complex software packages would be accessed over a network by client terminals. The difference today is that the “mainframe computer” is global, and the “clients” are portable and can be used almost anywhere, giving users an unprecedented combination of computing power and portability which is rapidly reshaping our relationship with technology.